Happy Healthy Home: Tahoe Area Mountain Biking Association Needs your Help! Tahoe Area Mountain Biking Association Needs your Help! Alright Tahoe needs your help and you know I would only ask if it was serious :) We are so close! As of this morning will were only trailing by 1 %. Bell Helmets is awarding $100,000 to build three new trails, and our local trail group TAMBA (Tahoe Area Mountain Biking Association) has been selected as one of the twelve finalists (out of 100 entries!). Once complete the Corral Trail will be a model for how trails with mountain bike specific features can legally be built in our public forests around the country, showing a model of partnership between the local community and the US Forest Service. Tahoe is competing against projects in Vermont, Alabama, and Indiana – a vote for Corral Trail means the world to us Tahoe mountain bikers and the US Forest Service. 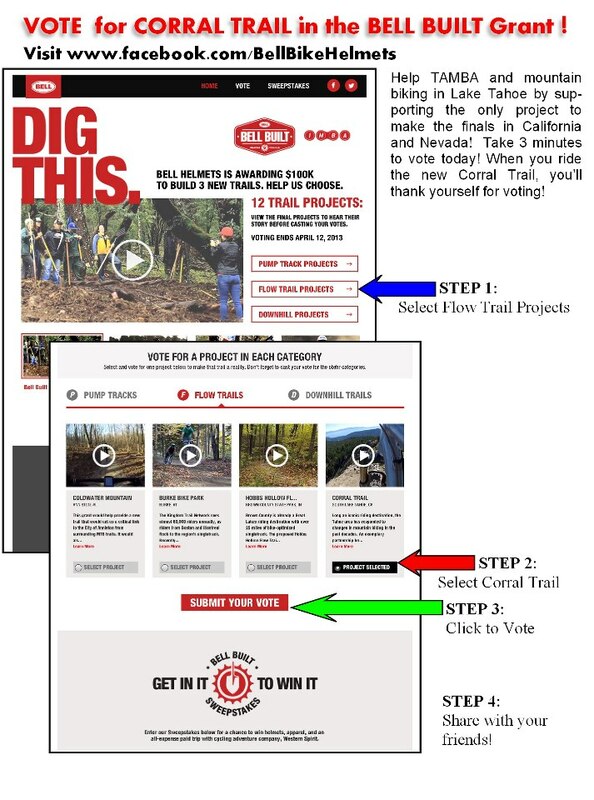 VOTE for Corral Trail here (under Flow Trail Projects) by April 12th. We would love for Corral to be one of those three winning projects. Help by spreading the word and remember to vote for Corral on the Bell Facebook page by April 12th. Read the proposal to find out more at TAMBA.org. Hope you're having a fabulous week, pretty lady!